In this study, the effects of thawing in running water, microwave and room temperature on protein quality of rainbow trout (Oncorhynchus mykiss) and sardine (Sardina pilchardus) were investigated. The amounts of myofibriller protein, protein solubility and Sodium dodecyl sulfate polyacrylamide gel electrophoresis (SDS-PAGE) were analyzed to determine the proteinquality of fish. The amount of myofibriller protein significantly decreased in each two fish species as a result of freezing-thawing process (p0.05). 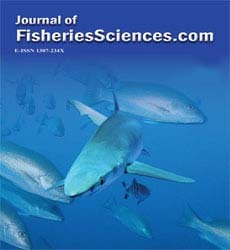 Thawing in microwave and room temperature caused a decrease in the amount of myofibriller proteins of rainbow tout and sardine (p0.05) In general, freezing-thawing process caused a significant decrease in protein solubility (p0.05), while the effect of different hawing process on protein solubility changed depending on fsh species. The highest protein solubility in rainbow torut and sardine obtained with thawing in running water. As a result of SDS-PAGE, it was found that the different thawing methods didn’t cause protein denaturation via disulfide covalent bonds. According to these data, it was suggested that the reason of the decrease in protein solubility could be resulted from polymerization of protein via non-disulphide covalent bonds and/or interaction of protein with other compounds such as the lipid-protein interaction.